Your report on page 8 of the September-November, 1994 issue tells of Professor Graham Pont's belief that humans learnt to sing from the birds, from which mankind developed speech. Unfortunately, he does not consider it may have been the other way around, that birds copied man's attempt at singing. A short while ago, at someone else's residence, I heard a bird song coming from the house. The song took on a familiar sound: 'Brr brr—brr brr'. When I looked, I found the bird cage close to the telephone and the bird had picked up the sound of the ring, in pitch and timing, to perfection. According to the good professor's theory, perhaps the telephone learnt the sound from the bird! Thank you for the copies of the magazine. I think the art-work is beautiful. Would you please let your readers know that in my article, which pointed out the problems I have uncovered in evolutionary reconstructions of Neanderthal children's fossils (December-February issue), two bibliographical references given in the captions were obviously unchanged when later drafts of the article were produced. In Figure 1, 'Bibliography, Ref.2' should be 'Bibliography, Ref.3', and in Figure 5, 'Bibliography, Ref.5' should be 'Bibliography, Ref.6'. I recently purchased the book Telling Lies for God, by Professor Ian Plimer of Melbourne University. I have made a diligent search through anti-creationist literature for authors to produce a solitary piece of incontrovertible evidence in support of the theory of evolution. Unable to dispassionately wheel out a solitary exhibit for his case, Plimer uses emotionalism, innuendo and sarcasm. The book lacks scholarship and devalues the academic standing of Melbourne University. Plimer has in fact done the creation science movement a service by producing this book. Independent thinkers and genuine seekers of truth will see the blustering emotional style as a treatise that is bereft of content, resorting to bullying tactics in the absence of factual material. Regarding '9 tips for Christian parents on preparing children to face the world' (March-May, 1994), Christians need to exercise God's calling to 'train up a child', and not pretend that the public schools should attempt this. Even a Bible scholar could not find one example in the Bible where the Hebrews willingly sent their children to Philistine schools. Homeschool, and at the very least private school, should be strongly encouraged by Christian magazines as an alternative. It works! The best place to 'train up a child' is the home — more specifically, the homeschool. Skeptic Michael Shermer has made another mistake by implying that Creation magazine is the only creationist publication to correct or replace former creationist arguments when new evidence comes to hand (Letters, December-February). He obviously has not done his homework, for a detailed treatment of the moon dust issue was published in the Creation Ex Nihilo Technical Journal, Vol.7 No.1, 1993, pp. 2-42. 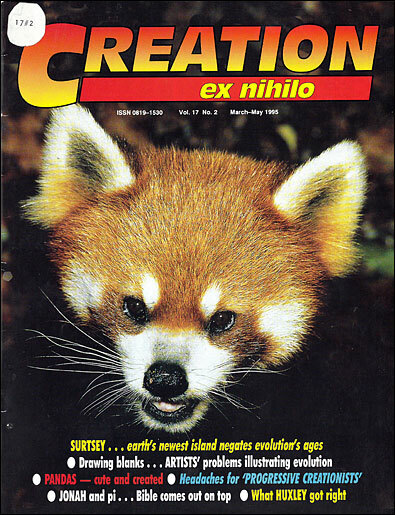 And evidence contrary to the creationist proposition that the speed of light has decayed has been published in the Creation Research Society Quarterly and the Creation Ex Nihilo Technical Journal. Yes, Michael, unlike religion, empirical science is self-correcting. So if the Skeptics' agenda is to expose religious error using empirical science, when will you publish the papers that have been written to show how empirical science invalidates the religion of evolution? We are skeptical of your skepticism. I refer to the article by Dr Clifford Wilson (Genesis and the Lost Tablets) and to his statement that the figures of the Sumerian King List from Kish are based 'on sixes and not on decimals'. Where does this information come from?